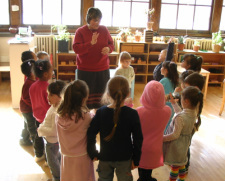 The Fernwood Montessori School Fund has been established as a separate fund within the MPS Foundation, a non-profit, tax-exempt corporation in accordance with Section 501(c)(3) of the Internal Revenue Code for educational and charitable purposes. The Fund was established under the MPS Foundation to utilize its tax-exempt status, organizational efficiencies and liability insurance. The Fernwood Fund gratefully accepts gifts by cash or check, appreciated securities, corporate matching gifts, and family and foundation gifts. Please use the MPS Foundation Gift Form to ensure your donation is earmarked for Fernwood. Download the form at this link. To learn more about the Fund's priorities and allocations please attend an open board meeting or review the meeting minutes.